This paper investigated the spatial and temporal variations of pCO2 in the Yellow River watershed. While the pCO2 responded exponentially to total suspended solids (TSS) export when the TSS concentration was less than 100 kg m-3, it decreased and remained stable thereafter if the TSS concentration was greater than 100 kg m-3. The average pCO2 for the watershed was estimated at 2810±1985 μatm, indicating a large potential for CO2 evasion. Grasslands cover vast terrestrial areas and the main biomass is concentrated in the lowest part of the canopy. We found that measured transport times in the lowermost canopy layer are fastest during nighttime. During daytime, the reaction of NO with O3, as well as NO2 uptake by plants, was faster than transport. This suggests that grassland canopies of similar structure may exhibit a strong potential to retain soil emitted NO due to oxidation and subsequent uptake of NO2 by plants. 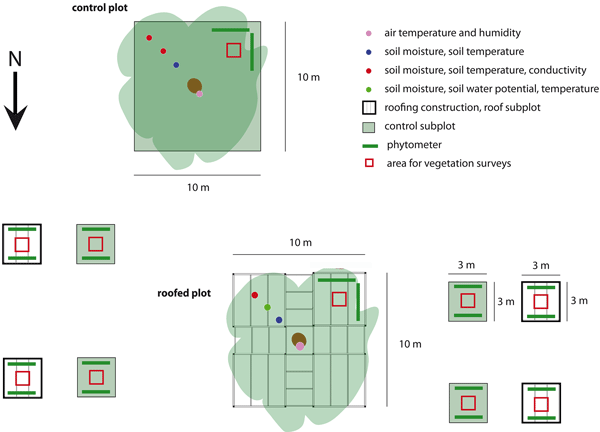 This paper introduces a novel rainfall reduction experiment to investigate drought effects on soil-forest-understory-ecosystems. An annual drought with a return period of 40 years was imposed, while other ecosystem variables (humidity, air & soil temperature) remained unaffected. The first year of drought showed considerable changes in soil moisture dynamics, which affected leaf stomatal conductance of understory species as well as evapotranspiration rates of the forest understory ecosystem. The KEOPS2 oceanographic study surveyed more than 30 sites downstream from the Kerguelen Islands in the Southern Ocean to examine the degree of variation in phytoplankton community responses to natural iron inputs. Our observations of community structure based on the chemical compositions of six microbial size fractions suggest that early spring trophodynamic and export responses differed between regions with persistently low levels versus punctually high levels of iron fertilisation. The origin and dynamics of particulate organic matter were studied in a 11.6km² catchment (northern Laos) during the first erosive flood of the 2012 rainy season. Upstream suspended sediments mainly originated from cultivated soils labelled by their C3 vegetation cover. In contrast, channel banks with C4 vegetation supplied significant quantities of sediment to the river downstream. Swamps located along the main stream acted as sediment filters and controlled the composition of suspended POM. Climate-induced drying and warming in continental bogs is expected to initially accelerate carbon losses via ecosystem respiration, but persistent drought and warming is expected to restore the peatland’s original carbon sink function as a result of the shifts in vegetation composition and productivity between the microforms and increased NPP of trees over time. Thus, the treed bogs are climate-sensitive but temporally adaptive ecosystems that have the potential to tolerate the changing climate. What prevents nitrogen depletion in the oxygen minimum zone of the eastern tropical South Pacific? A box model of the eastern tropical South Pacific oxygen minimum zone suggests that anaerobic water-column remineralization rates have to be slower than aerobic remineralization in order to explain the relatively high values of observed nitrate concentrations. Lateral oxygen supply sufficient to oxidize about one-fifth of the export production is required to prevent an anoxic deep ocean. Under these circumstances, the region can be a net source of fixed nitrogen to the surrounding ocean. Ecological models often suffer from substantial biases due to inaccurate simulations of complex ecological processes. We introduce a set of scaling factors (parameters) for an ecological model on the basis of plant functional type (PFT) and latitudes. A global carbon assimilation system (GCAS-DOM) is developed by employing a dual optimization method (DOM) to invert the time-dependent ecological model parameter state and the net carbon flux state on 1 degree grid cells simultaneously. Net ecosystem productivity (NEP) in seasonally dry Amazon forests varies greatly between sites with similar precipitation patterns. We ran CLASS-CTEM at two LBA Amazon sites (Tapajós 83km & Jarú Reserve) that exhibit opposite seasonal NEP cycles despite reasonably similar meteorological conditions. We find the influence of soil texture and depth, through soil moisture, on seasonal patterns of GPP and, especially, heterotrophic respiration is important for correctly simulating NEP seasonality. Today’s oceans show distinct mid-depth oxygen minima while whole oceanic basins became transiently anoxic in the Mesozoic. To constrain past bottom-water oxygenation, we compared sediments from the Peruvian OMZ with the Cenomanian OAE 2 from Morocco. Corg accumulation rates in laminated OAE 2 sections match Holocene rates off Peru. Laminated deposits are found at oxygen levels of < 7µmol kg-1; crab burrows appear at 10µmol kg-1 today, both defining threshold values for palaeoreconstructions. Colonization of life on Surtsey has been observed systematically since the formation of the island. Microbial colonization and the influence of associate vegetation and birds on viable counts of environmental bacteria at the surface of the Surtsey was explored for the first time in diverse surface soils. Also, hot subsurface samples deep in the centre of this volcanic island were collected. Both uncultivated bacteria and archaea were found in the subsurface samples collected below 145 m.
The boron isotope composition in the skeleton of massive Porites corals from the central Great Barrier Reef is used to reconstruct the seawater pH over the 1940-2009 period. The long-term decline in the coral-reconstructed seawater pH is in close agreement with estimates based on the CO2 uptake by surface waters due to rising atmospheric levels. We also observed a significant relationship between terrestrial runoff data and the inshore coral boron isotopes records. Along a transect in the warm nutrient-depleted Mediterranean Sea, we found that microorganisms shared phosphate resources by using different uptake strategies. Heterotrophic prokaryotes dominated phosphate uptake in the upper layers while cyanobacteria dominated uptake fluxes around the deep chlorophyll maximum depth. Synechococcus seemed well equipped to respond to pulses of phosphate, whereas Prochlorococcus and heterotrophs were more adapted to very low concentrations. Subsurface observations of ocean plastics are very scarce but essential for adequate estimates of marine plastic pollution levels. We sampled plastics from the sea surface to a depth of 5m, at 0.5m intervals. Vertical mixing was dependent on sea state and affected the abundance, mass, and sizes of plastic debris floating at the sea surface. This has important implications for studies assessing at-sea plastic load, size distribution, drifting pattern, and impact on marine species and habitats.